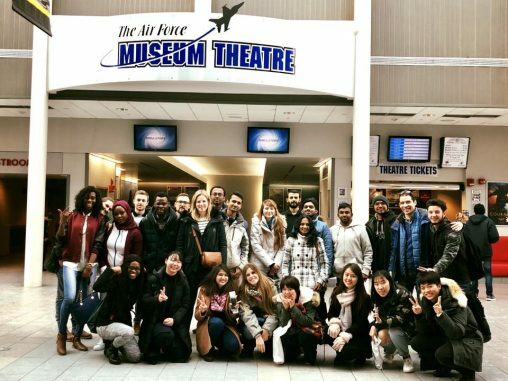 Wright State’s University Center for International Education has been showing students local attractions and resources through trips in and around Dayton, including the National Museum of the U.S. Air Force. Wright State’s University Center for International Education has been showing students local attractions and resources through trips in and around Dayton. The series of excursions teaches international students about local events, as well as getting them involved in Dayton area activities. Catherine Hernandez, international student program coordinator, said taking international students to visit local attractions not only helps them to reach out and make new friends, but it can also help in their academic career. “I believe that the more a student is connected to the community, the more successful they are, they’ll have a lot less stress,” she said. The students explored Dayton in a variety of ways. First, they learned about the Dayton RTA. Students received a 30-minute lesson on how to use the bus system visited the RTA hub, where they learned routes that would take them to local attractions and festivals in Dayton. While in Dayton, Nan Whaley, mayor of Dayton and a 2009 M.P.A. graduate of Wright State, spoke to the students, telling them about the history of Dayton and giving them tips about leadership. Teaching international students about leadership may someday change the world, Hernandez said. To celebrate the Winter Olympics in PyeongChang, Korea, UCIE also hosted skiing, snowboarding and ice-skating events for students. 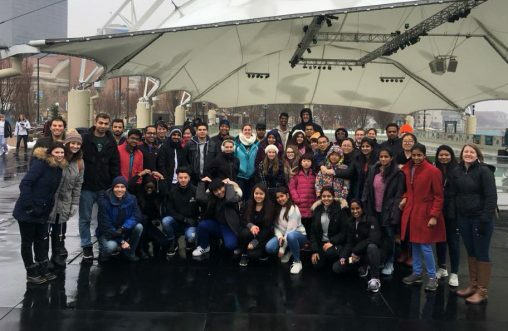 Students also visited Riverscape Metropark, the Dayton library, where they got a personal tour from the staff, and DK Effect, an arcade in Dayton. In addition to the trip to Dayton, students have visited other local attractions, such as the National Museum of the U.S. Air Force, where they learned about the history of aviation, and Beaver-Vu Bowl. To celebrate the Winter Olympics in PyeongChang, Korea, UCIE also hosted skiing, snowboarding and ice-skating events for students. Nearly 60 students went skiing and snowboarding, and nearly 80 went ice skating. During their skate, instructor Lesli Nachbauer talked to the students about the history of figure skating.